TAO, the watcher, sat on the ledge before the cave, back against a rock, knees drawn up with arms hugging them while soft night noises emanated from the jungle to his right, and the heavy breathing of Og and Ru and Big Tooth came from the cave door to his left. For a long time he had sat thus while the big silver disc of a moon climbed high above the forest and flooded the valley below with silvery light that revealed the village cane garden, the goat pen fenced with twisted wattle, and the gleaming river beyond. He was supposed to be watching for the saber-toothed slayer, the cave tiger that had been raiding the goat pen, while inside the cave Og and his two companions slept with their bows beside them, ready to leap out with his first warning and send a shower of arrows at the marauder. But Tao was not watching. Indeed he had not been watching for some time, for as he sat there his head had dropped forward and his eyes closed. He was breathing, now, in rhythm with the snores that emanated from the cave entrance. He slept, and so soundly that he was not aware of the big slinking figure of the cave cat, with massive paws, long saber-like teeth, and short lashing tail, that crept out of the jungle, glared savagely about, then moved like a shadow down the valley toward the goat pen. Indeed he knew nothing of the presence of the striped slayer until suddenly a savage, snarling roar accompanied by the rending of wood and the frantic, appealing bleat of panic-stricken goats awoke the echoes of the night, and then, of course, knowledge of the saber-tooth's presence was too late. Tao awakened in time to see the great beast leaping the partly crushed down wattled fence, and with the limp and dangling form of the stricken goat hanging from its jaws, depart into the jungle. "Og! Ru! The Saber-Tooth! He kills another goat!" His shouts were not needed to arouse anyone, however, for with the snarling roar of the killer Og and Ru and Big Tooth had also awakened, and even as Tao called them they came hurrying out of the cave, arrows strung. But they arrived too late, for all they saw was the swiftly bounding figure of the saber-tooth as he sped toward the jungle. They sent shafts hissing after him, but none found their mark, for the big beast: faded into the blackness like magic and disappeared, while the people of the village, awakened by the commotion; stood in the doorways of the caves and trembled, for even the voice of the big cat struck terror in their hearts. For a moment Og and Ru and Big Tooth stared after the tiger. Then suddenly they turned on Tao. "Why did you wait so long to call us?" demanded Ru. "Hi-yah! You slept, Tao. Do not deny it," said Og, staring hard at the boy. For just a moment Tao was silent. Then he hung his head. "Aye, Og! I slept." he admitted. "Just a little while I dozed and..."
"Hah!" stormed Ru. "And in that little while the cave tiger came..."
"And another of our goats went away with him," added Og. "This is bad, Tao. He might have taken a child from the caves for all of you." "Aye, it is bad,"' said Big Tooth. "For this he should get a clubbing. We have worked too long to catch these goats for him to go to sleep while he watches them," growled Ru. "But  but I was thinking, Og, and thinking makes one sleepy  sometimes," said Tao pleadingly. "Hah, thinking! One has no right to think when he watches for a saber-tooth tiger. If you had called us when he first came out of the jungle we could have killed him," stormed Ru. "My hand itches now to club you with the handle of my stone axe." "l was thinking of a way to kill that tiger, Og," said Tao. "And almost I have found that way  when  when  I must have dropped off to sleep." "That is no excuse, Og. Let me flog him." cried Ru, making a. lunging grab for Tao's wrist as he yanked his stone axe from his girdle, and reversing the weapon made ready to thump Tao with the handle. But Og stopped him. "Aye, it is the law," said Ru. "but there is no reason why he should not be flogged now and again at daylight in the council circle. He deserves it." "The flogging he will get to-morrow will be enough,"' said Og. "Let us return to the cave. That saber-toothed slaver will not come back this night. To-morrow you will call the council, eh, Big Tooth, and decide on the punishment for Tao?" "Aye. To-morrow I will call the council." said the leader of the Flat Heads. Then, turning, the three went back into their caves and to their wolfskin beds, ignoring Tao, who, with head hanging in shame, watched them go. When they were inside, lonesome and unhappy he sat down on the ledge again with his back against a rock, and gazed unhappily up at the course of the moon across the night sky. For a long time he sat thus in silence, but as the moon began to drop down behind the hills he got up and softly made his way back to the cave doorway, where, pausing, he looked into the dark interior and listened to the heavy breathing of his companions. Then. tightening his girdle and shifting his own stone axe to a more comfortable position on his hip, he glided softly across the ledge and down the path to the jungle, where with a last backward look toward the cave that was occupied by his friends he vanished as silently as had the cave tiger. IN THE eyes of Og and Ru and indeed the whole Flat Head village where the three boys from the Cave People were living with Big Tooth, the young Flat Head leader, Tao had committed an unpardonable offense. To sleep on watch was a crime that at times, among the Cave People, had even been punished by stoning, which meant death, for an unwary watcher was worse than no watcher at all, since the cave dwellers put their confidence in him and slept soundly instead of warily. Tao realized the seriousness of his crime and it made him deeply unhappy, the more so perhaps since one of the precious goats that meant so much to Og had been carried off. These goats were more to Og, and to Ru and Tao, too, for that matter, than just so much meat. They were the beginning of a goat herd that Og hoped to build up as a reserve supply of food for the village, for since the Red Beards from the North had invaded the mountains and the forest, hunting goats had become increasingly more dangerous and Og had thought out the plan of capturing young goats and holding them in captivity against the time when the Red Beards might even attack and besiege the Flat Head village. But a cave tiger had discovered the goats in the valley of the Flat Heads and now and again raided the pen that had been built on the flat below the village canes. It was not the clubbing he would get that prompted Tao to slip away from the caves as the moon hung low in the heavens and dawn approached across the jungles. Indeed he did not think of the flogging, for while he sat there under the moon after Og and the rest of the village slept once more, slowly he had pieced together his thoughts and worked out his plan to kill the tiger. And now alone he glided into the jungle to exterminate the saber-toothed slayer without bow and arrow or the help of others. SWIFTLY, traveling with all the stealth of a skilled jungle hunter, the boy glided along one game trail after another until he reached the rocky fastness of the hills well behind the village. Dawn was breaking when he got this far, and with eyes and sensitive nostrils he had little difficulty in picking out the trail of the killer cat and following it until it entered a rocky canyon where he found the entrance to the saber-tooth's lair, a black opening among some boulders. Although the saber-tooth was not in sight, the half eaten remains of the recently killed goat marked the home of the killer, and Tao was confident the killer was in his den even then, sleeping comfortably. Crouching on a ledge, the boy surveyed that section of the canyon and the ledges on either side until he found just the location he wanted, a shelf some distance from the tiger's lair with a slight overhang and a sheer drop below to the bottom of the canyon. The declivity narrowed there, too, which would be of further aid in his plan. Swiftly, silently, he made his way to the ledge, looking for loose rocks. There were not many on this side of the canyon and those he found were either too small, or far too large for his purpose. TAO sat and pondered hard and long. He thought of many things. Then suddenly he thought of Og's bow. The bow lent strength to Og's arm. Perhaps a piece of wood would lend strength enough to him to move this boulder. With his mind groping he left the boulder and slipped along the ledges out of the canyon and into the forest, and after a time he returned again with a long and stout section of young tree trunk over his shoulder and two round smaller sections under his arm. The two smaller sections he laid down beside the boulder while he experimented with the longer section. One end of this young tree trunk he wedged under the edge of the boulder and began to pry upward. The rock could be raised a little but not enough. Still groping he tried other methods. and then suddenly he got the idea of using smaller rocks to brace his lever. He found then, to his joy and amazement, that by resting the tree trunk across this second rock and prying upward, he could raise the edge of the boulder, and the further out on the tree trunk he pulled, the easier it was to lift the great weight of the huge stone, and with scarcely any sound either. Tao did not know that he had discovered the first principles of leverage against a fulcrum. He did know, however, that he could raise the edge of the boulder so that he could get one of the round sections of wood under it, which was what he wanted to do, for all night long his brain had been toying with the thought of putting rollers under a great stone to make it move more easily. With this accomplished Tao smiled broadly. The boulder was ready. With just a shove it could be sent over the edge of the ledge and crashing down to crush anything underneath. He had achieved a simple, but quite remarkable piece of engineering for a cave man. Now all he had to do was to bide his time and wait for the tiger to pass just under this ledge. And so he crouched there with his eyes on the tiger's lair, but while he waited, he suddenly became aware of stealthy sounds coming up from the direction of the entrance of the canyon, and turning to look in that direction he discovered, to his amazement, three figures making their way cautiously along the opposite wall of the declivity. He identified them quickly as Og and Ru and Big Tooth, and for a moment he was disturbed or he had a vague idea that they had come after him to take him back to the village for the flogging that was due him. But as he watched them he realized that that was not the purpose of their presence in the canyon. They, too, had come to hunt the tiger. Tao was tempted, first, to call to them and reveal his presence and his plan. But he realized that his voice might warn the tiger, and so he crouched beside his boulder, partly hidden from them, and watched them as they made their way up the canyon. In spite of their caution Ru, in trying to work his way around a jutting boulder, following Og, unexpectedly stepped on a loose stone. Tao, watching him, saw him lose his balance, clutch wildly at the rock, then as his fingers found nothing to hold fast to, with a yell of terror, he pitched backward, twisted once in the air, struck an out-jutting rock solidly, and tumbled limply down the rest of the slope to the canyon floor, where he lay in a twisted, helpless heap, quite unconscious. Tao's heart almost stopped beating as he saw what had happened to Ru, but the next instant it raced on swiftly spurred by fear, for even as he, from his side of the canyon, stared down at Ru, while Og and Big Tooth from the other side looked at his limp form below them in horror, from up the canyon came the deep-toned, blood-chilling roar of the saber-toothed slayer, standing in the doorway of his cave, tufted ears cocked forward, eyes blazing with hate, and jaws open. "We must go down into the canyon. Come! Hurry! Follow me!" said Og, starting downward. "But the tiger! Already he comes this way," exclaimed Big Tooth. "Never mind. We must get Ru," insisted Og. 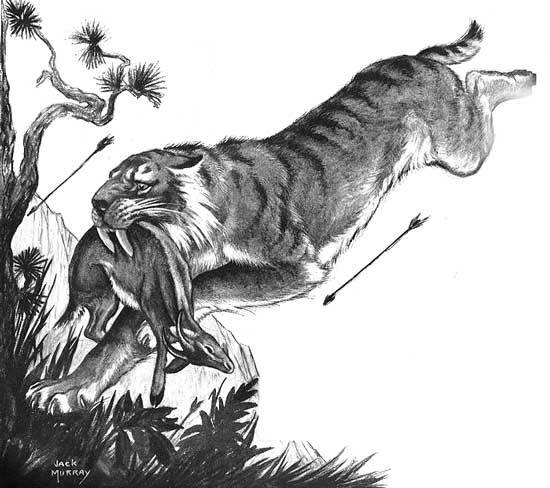 "If the tiger comes too close send an arrow into him. If he charges us then we must fight him off with our stone axes. Come." The tiger resented the intrusion of the cave men. The picture of savagery the beast made sent chills racing up and down Tao's spine and he knew full well that valiant fighters though Og and Big Tooth were, they would never be a match for this great beast with their bows and arrows, nor yet heavy stone axes. The tiger would get them both with his first charge, striking them down with his massive paws, and if their necks and backs were not broken with those first blows, he would pounce upon them and tear them to pieces with his terrible claws and jaws. Og and Big Tooth had just one chance of reaching Ru and getting him safely out of the canyon, and that chance depended entirely upon Tao and his balanced boulder on that ledge. If he could not time the fall of the rock just right, he knew full well that the fate of all three of his friends was sealed. Grimly Tao braced himself, ready to knock the stone loose that held the first roller in place, and with a mighty heave of his lever send the great rock hurtling downward. His eyes were on the saber-toothed slayer as it came down the canyon, moving in short, quick rushes, than pausing momentarily while its voice rolled through the mountains and his stubby tail lashed savagely. Nearer and nearer came the big beast, and tenser grew Tao as he waited. His foot was against the stone chock, his lever braced and ready. The cave tiger moved forward again in a short rush, that, as luck would have it, brought him almost directly under Tao's ledge. There he stopped and crouched lower while an ugly snarl wrenched from his throat as he glared at Og and Big Tooth, now bending over the still helpless Ru. And as that snarl echoed up to Tao he slid the stone chock gently from under the roller and leaned with all his weight against his lever. Slowly, heavily the boulder started, then suddenly it slid forward with a rush but with scarcely any noise. For an instant it balanced on the edge of the ledge, then, with a slight scraping sound, pitched over to go whirling down through space. That slight scrape of boulder against the edge caught the cave cat's attention. So concentrated was the beast's interest on the three cave men that it looked up with an unexpected start at the sound from above. But even as it raised its ugly head and glared toward Tao, the heavy boulder came hurtling downward. With a snarled scream, half of fear and half of thwarted anger, the great cat tried to twist out of the way, but Tao's ponderous missive of death struck it squarely in the back and crushed its hind quarters down against the canyon floor, and the beast's shrieking scream was choked off into a death sob. So sudden and unexpected did this turn come in the desperate situation that Og and Big Tooth, who were getting ready to sell their life dearly to the tiger, looked up in amazement. And when they saw Tao standing on the edge of the ledge they could not believe their eyes. "Hi-i-i-i-i-i-yah! Tao! Did you do this?" cried Og incredulously. "Aye. I hurled it," cried Tao joyously. "With the aid of a few logs and the hard thinking I did last night, I hurled it down from this ledge and killed the Cave Tiger." "Hi-yah!" cried Og. "That was powerful thinking you must have done. You deserved well to fall asleep after that. Come down here and help us with Ru, then we will all go back to the village and we mill tell the Council that you are a great man and deserve the cheers of the people instead of the flogging they would give you."